“If you need to throw 96 dB across 622 feet, we can do that with the R6-51MAX and those are conservative numbers,” quipped Chris Barrow, Director of Product Marketing at Community (Demo Room N113). The three-way mega horn-loaded speaker had just gone silent after a demure demo that tastefully exercised the musicality of the speaker rather than its brawn. Community R6 51MACommunity is also showing its newly rounded out family of I Series speakers, which extends the premium compact line into new territory with the IC6-1062, IC6-1082 and IC6-2082 models. All of the above are available in weather-resistant models constructed in-house with Community’s exclusive PolyGlas material. Sizing up audio for the size and specs of the demo room was the theme at d&b audiotechnik (Demo Room N117), where the ease of building a system with ArrayCalc was the star of the show. Delivering that sound to far-flung points just got easier with the new DS10 audio network bridge, which is now integrated with QSC’s Q-SYS for control. Further shaping that sound is a new integration with Beckhoff’s automation technology, which is a new capability that will be announced when Beckhoff joins the OCA Alliance here at the show. 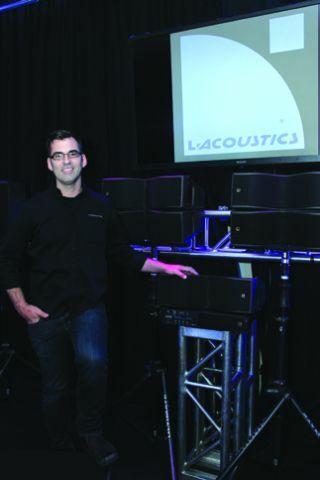 Scott Sugden, Head of Application Touring, L-AcousticsAnother premiere, and in this case on a global level, is the new KIVA II from L Acoustics (Demo Room N120). Shown for the first time here in Las Vegas and now packing +6 dB in power with better dynamics and stability, the new version of KIVA enjoys a top-caliber demo with tracks encoded in their native resolution and delivered directly to the boxes via AVB. Maybe not surprisingly, an onlooker wondered if the demo was actually live musicians inside the room. For adjustable audio, check out the new CBT1000 column speaker from Harman (Demo Room N110), which provides individual upper and lower aiming capabilities. The new model will be available later this fall and requires an actual walk around the room to be believed, prompting attendees yesterday to pull out some sound meter apps for analysis. Also on demo for the first time is the new PD500 (which was here, but silent last year) and some exciting additions to the Control Series of surface-mounted speakers, available in dedicated low-impedance models. The outdoors are covered here, too, with the new Control 80 Series landscape speaker.